Joseph Besecker and Three Diamonds Farm’s Dunph tracked early leader B. B. Dude, took command midway around the turn and impressively kicked clear in deep stretch to comfortably win Sunday’s third running of the $300,000 Spendthrift Juvenile Stallion Stakes by 7 ¾ lengths over Naughty Joker on opening day of Churchill Downs’ 21-day Fall Meet. The Spendthrift Juvenile Stallion is a lucrative race exclusively for 2-year-old offspring sired by any active or non-active Spendthrift stallion, including all Spendthrift-owned stallions standing regionally in North America. The $300,000 purse was structured with a unique approach to award $150,000 to the breeders of the top four placed horses, with the remaining $150,000 allocated to the owners. Dunph, an unbeaten 2-year-old gelded son of Temple City out of the Sky Mesa mare Skymynx, ran seven furlongs over a “fast” track in 1:23.20 and earned $89,280 for the win to push his bankroll to $105,540. Tyler Gaffalione, fresh off his first Keeneland riding title, rode the winner for trainer Mike Maker. Previously, Dunph won his career debut at Penn National in a one-mile maiden special weight by 8 ½ lengths. Dunph returned $10.80, $6.20 and $4.80 as the 4-1 third betting choice in the field of nine juveniles. Naughty Joker, ridden by Julio Garcia, paid $5.20 and $4.20. Into the South, under Florent Geroux, was a head back of the runner-up and returned $5.20. They were followed by Kajawa, Gentle Warrior, mild 7-2 favorite Casa Creed, B. B. Dude, Achilles Warrior and Distorted Jimmy. Dunph was bred in Kentucky by Equus Farm. 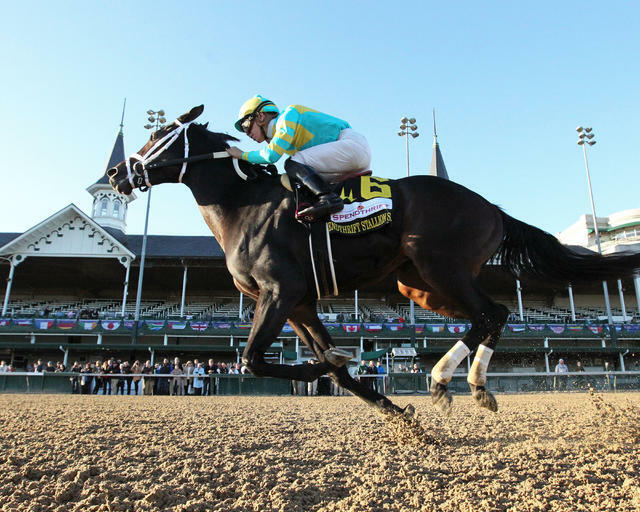 Racing at Churchill Downs resumes Wednesday at 1 p.m. with a 10-race program. There is a $27,659 carryover in the 20-cent Single 6 Jackpot, which covers Races 5-10.